Phillip J. Long, Professor of Bible and Biblical Languages at Grace Christian University, recently reviewed the Photo Companion to Acts on his blog, Reading Acts. His review is the lengthiest of this work to date and we are most grateful for drawing readers’ attention to the strengths and weaknesses of this resource. I first became aware of Bolen’s Pictorial Library of Biblical Lands at an ETS [Evangelical Theological Society annual meeting] in 2003. I have used these photographs in virtually every class I teach in order to add some colorful graphics to an otherwise dull PowerPoint presentation. Big smile here! We are thankful that our photos have been so useful. 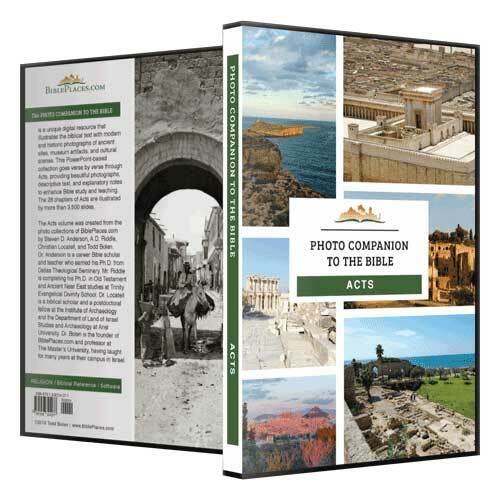 If you are teaching the Book of Acts, then the Photo Companion to the Bible is an essential collection of images to use to illustrate your lectures and sermons. If you are a student of the Bible, you can read the text of the Bible and page through the slides in order to place the text into a physical context. He notes a number of strengths of the collection, including the aerial photographs, the explanatory notes, the references to journal articles, and the free updates. In particular, he highlights the copyright concerns in using photographs that are alleviated by this resource. He also provides some critiques, including slides which do not seem on topic or which may be unnecessary. You can go to his full review for those and all of his other observations. We are very grateful to Dr. Long for his careful and thoughtful review. We invite you to consider using the Photo Companion to Acts in your own study or teaching of this book. Eggshells discovered in the City of David are the first evidence of chicken eggs used the diet of ancient Israelites. A group of high schoolers discovered a rare gold coin from the time of Theodosius II (AD 420) on a class trip in Galilee. A new archaeological visitor center has opened at Jokneam, at the base of Mount Carmel not far from Megiddo. The highlight is a 9th-century statue of the city’s ruler. There’s a slideshow on Facebook. The partnership between Israel Finkelstein and Tel Aviv University physics professor Eli Piasetzky began when the latter was volunteering undercover at the Megiddo excavation. The new Petra Museum has been inaugurated. It is located next to the main entrance to the site. Flora Brooke Anthony provides examples of how Egyptians depicted in art their northern neighbors in the Levant. Egypt's Ministry of Antiquities Newsletter for March 2019 is now online. Adriano Orsingher explains the purpose of Phoenician and Punic masks. Salvage excavations in Larnaca, Cyprus, revealed more than 110 tombs from the Early Bronze to the Late Roman periods. Lightning recently struck the Acropolis in Greece, closing it temporarily. “Life Lessons from Israel: Dan” is the latest video produced by Biblical Israel Ministries & Tours. Israel’s Good Name recounts his visit to Herodium. Now is the time to register for the 2019 season at Tell es-Safi/Gath. 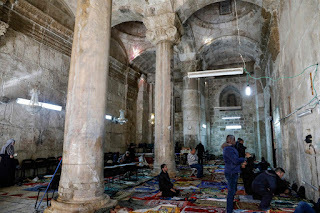 Carl Rasmussen’s posts this week focus on Jesus’s crucifixion, including (1) crucified man from Jerusalem; (2) bone box of Caiaphas; (3) Church of the Holy Sepulcher; and (4) the best rolling stone tomb in Israel. 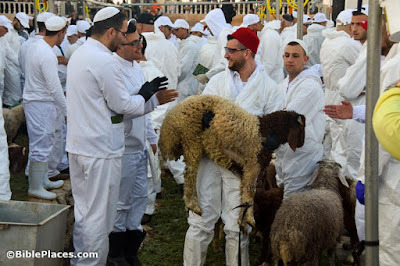 Pilgrims in Jerusalem yesterday celebrated Good Friday and Passover. Police arrested several people who were planning to smuggle two baby goats onto the Temple Mount for a sacrifice. The Samaritans celebrated Passover on Thursday evening. See below for a few photos my son took at the event. 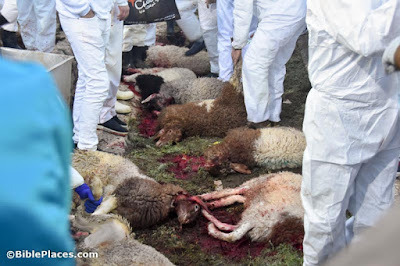 "He was led like a lamb to the slaughter..."
"And as a sheep before her shearers is silent, so he did not open his mouth..."
"He was cut off from the land of the living; for the transgression of my people he was stricken..."
A large statue of Trajan has been discovered in Laodicea. Archaeologists have excavated another thermopolium in Pompeii, bringing the number to about 80. Steps believed to be from the palace of Pontius Pilate in Jerusalem have been re-opened to visitors in Rome after 300 years. The palace of Nero is now open to visitors and includes virtual reality features. An ancient shipwreck off the Greek island of Alonissos is now being opened to recreational divers. The Temple Mount Sifting Project will re-start its sifting work on Jerusalem Day, June 2, but at a new location. David Moster has released a new 5-minute video on butter churns from the ancient world. Eisenbrauns has a 40-50% off sale through Sunday on some books related to ancient Israel. New release: Excavations at Karkemish I. The Stratigraphic Sequence of Area G in the Inner Town, edited by F. Zaina. The print volume is available for purchase; the pdf is available for free (third item from the bottom). Keith Taillon explains how Egyptian obelisks ended up in Paris, London, and New York City. Luxor Times posts photos of the Grand Egyptian Museum, scheduled to open next year. Brent Nongbri explains the archaeology of early Christian manuscripts. The study of imagery from U2 spy planes is revealing numerous archaeological features. Carl Rasmussen is giving a nicely illustrated tour of the Tomb of Annas, beginning with the exterior and continuing inside. 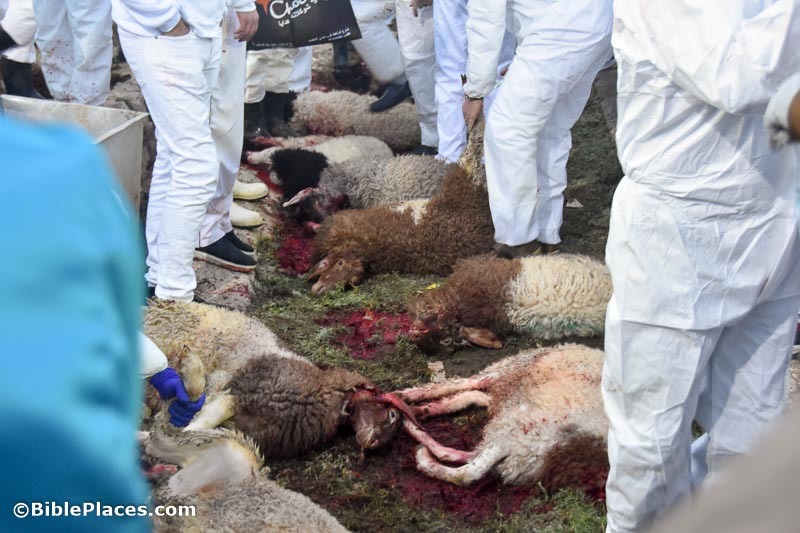 Ferrell’s favorite photo is one he took last week of a ewe and lamb grazing along the road from Jericho to Jerusalem. A 1st-century Jewish settlement is now being excavated near Beersheba, and one find is an early depiction of a nine-branched menorah. Christopher Rollston offers some reflections on the Nathan-Melek seal impression, concluding that it is “most likely” that this is the same person mentioned in the Bible. Hasmonean-era tombs near Jericho have been looted recently. Conservation work was done on the Western Wall ahead of the Passover holiday. With 40 inches of rainfall so far this year, the Sea of Galilee rose 6 inches last weekend. Recent rains caused flash flooding near the tomb of Cyrus in Pasargadae. David Moster explains “Telling Time in Ancient Israel” in a new 9-minute video. Wayne Stiles has just announced a tour to sites in Turkey and Greece, including a 3-night cruise to the Greek isles. Reported on April 1: the discovery of the world’s oldest break-up letter. If you’ve been thinking about registering for the Institute of Biblical Context conference this June, note that the early bird discount ends on Wednesday. This video shows footage of Jerusalem one month after the Six-Day War in 1967. A seal impression belonging to “Nathan-Melech, servant of the king” has been discovered in Jerusalem’s City of David. The inscription dates to about 600 BC, which is about the same time as a figure named “Nathan-Melech” served Josiah, king of Judah (2 Kgs 23:11). It’s not known if these two are the same person. The Times of Israel covers the story well and provides a number of illustrations. But you might want to begin with this well-made 3-minute video. I will just add that Robert Deutsch published an identical seal impression in his book Messages from the Past in 1999; both impressions were made from the same seal. The new discovery has the significant advantage of being found in context instead of on the antiquities market. Excavations in the Sharafat neighborhood in west Jerusalem revealed a Hasmonean-era agricultural village. 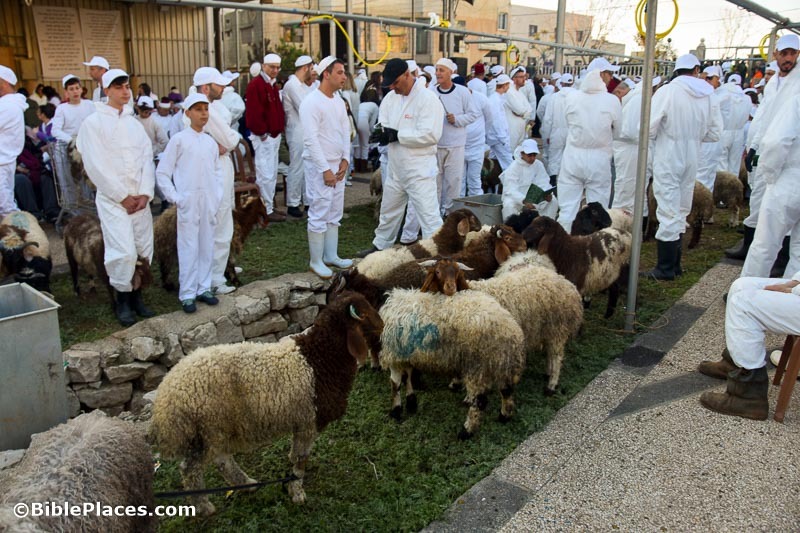 Haaretz (premium) has a longer article with more photos. A study of the garbage dumps of the Byzantine city of Elusa in Israel’s Negev reveals that the city’s decline was the result of climate change. The Malham Cave, under Mount Sedom near the Dead Sea, has been identified as the longest salt cave in the world. Amnon Ben Tor will be awarded the Israel Prize in the field of archaeology. Gabriel Barkay, an Israeli archaeology, recalls his experience in excavating Susa in Iran. The Anglo-Israel Archaeological Society will be hosting lectures in the coming months by Amihai Mazar (on Tel Rehov), Jonathan Price (on Beth Shearim), and Jürgen Zangenberg (on Horvat Kur). “Striking Power: Iconoclasm in Ancient Egypt” is a new exhibit at the Pulitzer Arts Foundation in St. Louis. A review article explains why so may of the statues’ noses are broken. The founder of Sirin Riders explains why Israel is a great place to ride horses. James Papandrea is on The Book and the Spade discussing his new book, A Week in the Life of Rome. One of the most exciting, but least visited, biblical sites is Susa. It’s exciting because the entire drama of the Book of Esther takes place there, and we know exactly where Ahasuerus sat on his throne, and Esther approached him, and Mordecai overheard the conspiracy, and Haman waited in the courtyard. Biblical Archaeology Review asked me to write about Susa for their “Site-Seeing” column for the current issue. You can flip to page 18 to see it, or it’s currently available for reading online. My goal in writing the column was help you to enjoy the site and its rich biblical connections, especially if you’re not ready yet to sign up for a tour of biblical Iran! An attempt to smuggle into Britain an ancient Babylonian kudurru as a “carved stone for home decoration” with a value of “300” failed. Israel has become the first country to list all cemetery tombstones online. The February 2019 issue of the Newsletter of the Egyptian Ministry of Antiquities includes the latest discoveries, repatriations, and news. A Greek archaeologist has been working in Alexandria for 15 years in an effort to find the tomb of Alexander the Great. A 3-minute video shows an animation of what the hanging gardens of Babylon may have looked like. The Museum of the Bible is hosting a two-session lecture series on “Jerusalem and Rome: Cultures in Context in the First Century CE,” featuring Eric Meyers, Mary Boatwright, Lawrence Schiffman, and Steven Notley. Six speakers will address the subject of “Egypt and Ancient Israel: Merneptah’s Canaanite Campaign—History of Propaganda?” in a conference at Southwestern Baptist Theological Seminary on March 26. Chris McKinny’s recent lecture on “Tel Burna—After a Decade of Investigation” is now online. The video includes all of his visuals. This is fascinating: Predators in the Thickets: A Film Interview with Two Botanists and a Zoologist in Israel. You’ll learn more about lions, bears, forests, thickets, the Zor, and the Ghor. The film is intended an introduction to the newly launched Dictionary of Nature Imagery of the Bible. A Greek inscription found at the Nabatean city of Halutza confirms previous scholarly identification of the site as Elusa. The Times of Israel article provides more information about the results of the excavation. Aren Maeir made a visit to Gath/Tell es-Safi this week, where everything is very green. Tel Tzuba (Belmont) is the latest destination for Israel’s Good Name. Cesares de Roma is a Spanish art project that has brought to life silicone images of Julius Caesar, Caesar Augustus, and Nero. The Romans attempted to ban wild Purim parties in the year 408. In light of the present controversy, Leen Ritmeyer explains the history of the Golden Gate of Jerusalem. Egypt has opened a 105-mile hiking trail called the “Red Sea Mountain Trail” that west of Hurghada. 40,000 runners from 80 different countries ran 42 kilometers in the Jerusalem Marathon. This isn’t new, but I haven’t seen it before: Flight of Faith: The Jesus Story is a 48-minute documentary with lots of aerial footage. The Bible Lands Museum in Jerusalem has opened a new exhibit entitled “Highway through History.” As part of the launch, they have created a five-minute drone video of Beth Shemesh and the excavations in preparation for the road expansion. The New York Times reviews “The World Between Empires” exhibit now at the Met. The “Alexander son of Simon” ossuary is possibly related to the man who carried Jesus’s cross. It is on display now at the Museum of the Bible in Washington, DC, and this week they recorded a short video about it. Apparently they were so inspired by an inquiry from your roundup writer. Egypt has preserved a unique Greco-Roman catacomb in Alexandria through a groundwater-lowering project. The new exhibit “Ancient Egypt: From Discovery to Display” at the University of Pennsylvania Museum walks the visitor through the archaeological process. John DeLancey shares photos he recently took inside the pharaohs’ tombs in the Valley of the Kings. The top archaeological finds from Greece in 2018 include the oldest known excerpt from Homer’s Odyssey and the most intact ancient Greek vessel ever found. This year’s Friends of ABR Fundraising Banquet will honor Bryant Wood. Emek Shaveh is requesting that the plans for renovation in the Jewish Quarter include opening the massive Nea Church from the Byzantine period. The controversy continues over whether the Muslims can open the Golden Gate to worshippers. The Karaite community is concerned that the proposed Jerusalem cable car will desecrate its ancient cemetery. Mark Barnes explains why Jesus was crucified outside Jerusalem. Ferrell shares a favorite photo this week of the Dead Sea. Israel’s Good Name shares nature photos from his hike along Nahal Alexander. The water level of the Sea of Galilee has risen above the lower red line for the first time in two years. A study of the mountain fortress of Sela confirms the importance of the site in the Iron II period. Video: An archaeologist is using drone imagery to track tomb looting in Jordan. The Department of Antiquities of Jordan has made some great resources available for free online, including the Annual of the Department of Antiquities of Jordan and Studies in the History and Archaeology of Jordan. New clues to the lost tomb of Alexander the Great are being unearthed in Egypt (National Geographic). Erin Blakemore recounts the tale of how a modern attempt to play King Tut’s trumpets went awry. Somehow John DeLancey is able to post summaries every day for his tours, including their recent days in Egypt. 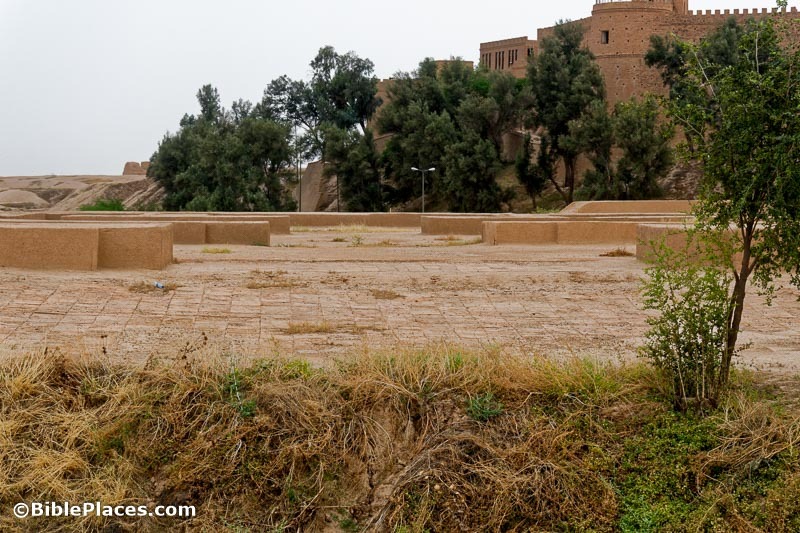 Iraq is seeking World Heritage List status for the ancient city of Babylon. 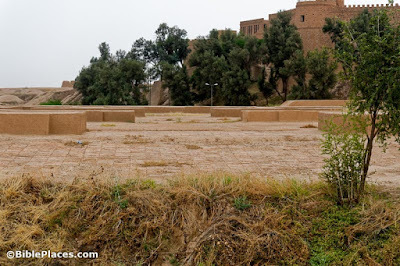 Tourists are apparently returning to the ancient city of Ur in southern Iraq. Esagil, Treasure Hunt in Babylon, is a a board game with a real-scale map of ancient Babylon. The opening of a spectacular ancient Jewish catacomb in Rome continues to be delayed. What is “biblical archaeology”? Owen Jarus provides some definitions and an introduction to some of the controversy surrounding its use. The majority, or perhaps even all, of the 75 new “Dead Sea Scrolls” fragments that have appeared on the market since 2002 are modern forgeries, according to Årstein Justnes and Josephine Munch Rasmussen. UPDATE: I am told by someone I trust that this article has many errors, including in its basic assertions. ASOR has begun its March Fellowship Madness 2019 to raise funds to help students and scholars. Ferrell Jenkins explains why he is fond of an “unattractive” photo taken at the Corinth Museum. Two new videos with Aaron Brody: Introduction to the Bade Museum and Repatriating Antiquities. “A well-preserved Greek inscription from the 5th century recording a blessing for one ‘Master Adios’” was discovered in central Israel. Plans to convert the Golden Gate of the Temple Mount into a Muslim place of prayer are being resisted by Israeli police. Two crews of antiquities thieves working in eastern Samaria were arrested in recent weeks. One of them was looting Alexandrium-Sartaba. A short trailer has been released promoting this season’s excavations at Tel Shimron. There is still time to sign up for this summer’s season at Tel Burna. Shiloh has some openings as well. Heavy rains this week caused flooding in the Jerusalem area. The Times of Israel shares a photo essay of wildflowers of the Dead Sea. Israel’s Good Name recounts his recent university trip to Wadi Dalia and Sartaba in eastern Samaria. Leon Mauldin reflects on Proverbs’ view of sluggards and ants, and he shares a photo of ants at Neot Kedumim. The BBC visits the recently opened Terra Sancta Museum in Jerusalem. I am on the Diligent Pastors podcast this week with Scot Chadwick, talking about the land of the Bible, photo collections, and preparing for a trip to Israel. Pastors especially may want to check out other episodes in this new podcast.